Draft: 2009, Milwaukee Brewers, 6th rd. October 2, 2018 San Antonio Missions released RHP Hiram Burgos. April 5, 2018 Hiram Burgos assigned to Colorado Springs Sky Sox. February 10, 2018 Milwaukee Brewers signed free agent RHP Hiram Burgos to a minor league contract. January 5, 2018 RHP Hiram Burgos assigned to Indios de Mayaguez. November 28, 2017 RHP Hiram Burgos assigned to Tigres del Licey. November 6, 2017 RHP Hiram Burgos elected free agency. September 11, 2017 Colorado Springs Sky Sox activated RHP Hiram Burgos from the 7-day disabled list. September 3, 2017 Colorado Springs Sky Sox placed RHP Hiram Burgos on the 7-day disabled list. September 1, 2017 RHP Hiram Burgos assigned to Colorado Springs Sky Sox from Helena Brewers. August 18, 2017 RHP Hiram Burgos assigned to Helena Brewers from Colorado Springs Sky Sox. August 16, 2017 RHP Hiram Burgos assigned to Colorado Springs Sky Sox from Biloxi Shuckers. July 17, 2017 RHP Hiram Burgos assigned to Biloxi Shuckers from Colorado Springs Sky Sox. July 9, 2017 Colorado Springs Sky Sox activated RHP Hiram Burgos from the 7-day disabled list. May 28, 2017 Colorado Springs Sky Sox placed RHP Hiram Burgos on the 7-day disabled list. May 20, 2017 Colorado Springs Sky Sox activated RHP Hiram Burgos from the temporarily inactive list. May 17, 2017 Colorado Springs Sky Sox placed RHP Hiram Burgos on the temporarily inactive list. January 27, 2017 RHP Hiram Burgos assigned to Puerto Rico. January 12, 2017 RHP Hiram Burgos assigned to Cangrejeros de Santurce from Indios de Mayaguez. December 15, 2016 Milwaukee Brewers signed free agent RHP Hiram Burgos to a minor league contract and invited him to spring training. December 15, 2016 RHP Hiram Burgos assigned to Colorado Springs Sky Sox. November 7, 2016 RHP Hiram Burgos elected free agency. June 15, 2016 Colorado Springs Sky Sox activated RHP Hiram Burgos from the 7-day disabled list. June 7, 2016 Colorado Springs Sky Sox placed RHP Hiram Burgos on the 7-day disabled list. January 30, 2016 RHP Hiram Burgos assigned to Puerto Rico. December 15, 2015 Milwaukee Brewers invited non-roster RHP Hiram Burgos to spring training. June 21, 2015 Colorado Springs Sky Sox activated RHP Hiram Burgos from the temporarily inactive list. June 16, 2015 RHP Hiram Burgos assigned to Colorado Springs Sky Sox from Biloxi Shuckers. May 16, 2015 RHP Hiram Burgos assigned to Biloxi Shuckers from Brevard County Manatees. April 2, 2015 RHP Hiram Burgos assigned to Brevard County Manatees from Colorado Springs Sky Sox. January 30, 2015 RHP Hiram Burgos assigned to Colorado Springs Sky Sox. January 30, 2015 RHP Hiram Burgos assigned to Puerto Rico. January 29, 2015 Milwaukee Brewers signed free agent RHP Hiram Burgos to a minor league contract. October 30, 2014 RHP Hiram Burgos assigned to Indios de Mayaguez. October 30, 2014 Indios de Mayaguez placed RHP Hiram Burgos on the reserve list. October 30, 2014 Indios de Mayaguez activated RHP Hiram Burgos. October 30, 2014 Hiram Burgos roster status changed by Indios de Mayaguez. September 2, 2014 Milwaukee Brewers released RHP Hiram Burgos. May 1, 2014 Nashville Sounds placed RHP Hiram Burgos on the 7-day disabled list retroactive to April 29, 2014. March 14, 2014 Milwaukee Brewers optioned RHP Hiram Burgos to Nashville Sounds. September 30, 2013 Milwaukee Brewers recalled Hiram Burgos from Nashville Sounds. September 3, 2013 Hiram Burgos roster status changed by Nashville Sounds. July 8, 2013 Nashville Sounds placed RHP Hiram Burgos on the 7-day disabled list. June 28, 2013 Milwaukee Brewers optioned RHP Hiram Burgos to Nashville Sounds. June 28, 2013 Hiram Burgos roster status changed by Nashville Sounds. June 22, 2013 Milwaukee Brewers sent RHP Hiram Burgos on a rehab assignment to Nashville Sounds. June 22, 2013 Hiram Burgos roster status changed by Nashville Sounds. June 18, 2013 Milwaukee Brewers sent RHP Hiram Burgos on a rehab assignment to Brevard County Manatees. 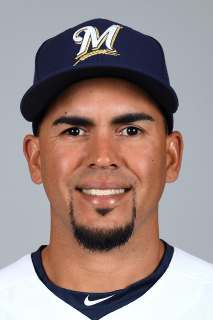 June 10, 2013 Milwaukee Brewers sent RHP Hiram Burgos on a rehab assignment to Wisconsin Timber Rattlers. May 24, 2013 Hiram Burgos roster status changed by Milwaukee Brewers. April 19, 2013 Milwaukee Brewers recalled RHP Hiram Burgos from Nashville Sounds. March 16, 2013 Milwaukee Brewers optioned Hiram Burgos to Nashville Sounds. November 20, 2012 Milwaukee Brewers selected the contract of Hiram Burgos from Nashville Sounds. July 28, 2012 Hiram Burgos assigned to Nashville Sounds from Huntsville Stars. May 12, 2012 Hiram Burgos assigned to Huntsville Stars from Brevard County Manatees. July 5, 2011 Hiram Burgos roster status changed by Brevard County Manatees. June 23, 2011 Brevard County Manatees placed RHP Hiram Burgos on the 7-day disabled list. April 7, 2011 RHP Hiram Burgos assigned to Brevard County Manatees from Wisconsin Timber Rattlers. July 19, 2010 Hiram Burgos assigned to Wisconsin Timber Rattlers from Helena Brewers. May 19, 2010 Hiram Burgos assigned to Helena Brewers from Wisconsin Timber Rattlers. April 5, 2010 Hiram Burgos assigned to Wisconsin Timber Rattlers from Helena Brewers. March 20, 2010 RHP Hiram Burgos assigned to Milwaukee Brewers. November 11, 2009 RHP Hiram Burgos assigned to Indios de Mayaguez. June 22, 2009 Hiram Burgos assigned to Helena Brewers from Milwaukee Brewers. June 21, 2009 Milwaukee Brewers signed RHP Hiram Burgos.